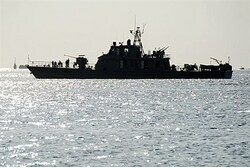 Sudan on Thursday denied that it has any connection with the Klos C ship, which Israel intercepted in the Red Sea and which was found to be carrying rockets from Iran to Gaza. “We have nothing to do with this,” a spokesman with Sudan’s foreign ministry, Abubakr Al-Siddiq, told AFP, adding that the vessel was in international waters. Israel intercepted the Klos C in the Red Sea between Eritrea and Sudan on Wednesday, claiming that Syrian-made weapons aboard had been shipped overland to Iran then onward by sea. The M302 missiles were to have been offloaded at Port Sudan and then taken overland towards Gaza via Egypt’s Sinai Peninsula. Khartoum’s links with Iran came under scrutiny after Sudan accused Israel of being behind an October 2012 strike against the Yarmouk military factory in the Sudanese capital, which led to speculation that Iranian weapons were stored or manufactured there. Iranian warships regularly dock in Port Sudan, in what Khartoum describes as “routine” visits. Khartoum has denied Iranian involvement in weapons manufacturing and has accused Israel of “spreading fabricated information”.